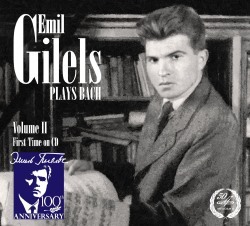 Emil Gilels’s Bach discography is certainly not vast, but its selectivity was based on an astute understanding of Bachian principles. He did play two of the keyboard concertos, the Fifth Brandenburg Concerto, a selection from the Well-Tempered Clavier, the fifth French Suite, the first Partita, the Chromatic Fantasia and Fugue and a few other pieces. But it is true that he was no Samuil Feinberg in terms of a broader and more spiritual commitment to Bach’s music. Instead he sought those works to which he was most particularly drawn and those Preludes and Fugues from the WTC which spoke most clearly to him. He didn’t feel an obligation to perform the whole thing. What we have is a valuable cache of his Bach performances, almost all studio recordings. It is volume 2 in Melodiya’s Gilels-Bach series. There are two transcriptions, one the familiar Siloti transcription of the Prelude BWV855 and the other Busoni’s leonine arrangement of the Prelude and Fugue for organ BWV532. This latter, recorded in 1968, with applause retained, is the only live performance and much the latest in date. Powerful, with rich organ sonorities evoked, it contains a smattering of wrong notes but plenty of virtuosic spirit. Everything else derives from studio sessions in 1948 and 1950. The Concerto in C major for two keyboards brings Gilels to the fore with Yakov Zak. They formed an enviable two-piano team around this time, and many of the major statements have been reissued by APR in recent years. Their rapport is undoubted in this performance, marshalled by Kondrashin, who provides some very purposeful tuttis in the finale. He is also on hand to direct the Brandenburg Concerto where Gilels is joined by his sister Elizaveta and flautist Nicolai Kharkovski. Fortunately this isn’t an especially stodgy recording, the violinist and flautist making a good tonal match – Elizaveta has rather a thin tone - and there is a full quotient of expressive exchange in the slow movement. The only demerit really is the way in which the soloists obscure orchestral themes in the finale, as they are too forwardly balanced. All these recordings are, apparently, making their first ever re-appearance on disc using the original masters. Andromeda, for instance, reissued this Brandenburg concerto in a 3-CD box devoted to the pianist. I reviewed it here, and it was horribly dull and airless, this Melodiya being effortlessly superior as a transfer. As a result one can afford to be a little lenient to Melodiya, which claims ‘first time on CD status’ for all material. The Partita No.1 in B flat major (Moscow, 1950) is also known from a live performance from the Great Hall of Moscow Conservatoire the same year, also in the Andromeda box. Whilst there he jettisoned repeats, he did no such thing in his commercial recording and it’s all the better for it. The booklet notes quote pertinently from Gilels’ interview with Lev Barenboim, whose book Emil Gilels – A Creative Portrait is the acknowledged source.